Ever since BERSIH (now more than just a movement for clean and fair elections) announced its intention to organize a rally to protest the embezzlement and laundering of billions of ringgit of public funds linked to the 1MDB scandal, the government appears to be going out of its way to hinder it. The TangkapMO1 rally is being similarly chastised. A whole array of reasons have been conjured up to explain why these demonstrations should not be allowed – its against the national interest, its disruptive, it will harm the economy, it could lead to violence, it leaves a mess, etc. This being Malaysia, it won’t be long before religious officials also get in on the act with edicts, injunctions and warnings against joining such demonstrations on pain of losing one’s soul. In the meantime, one minister, in urging would-be demonstrators to respect DBKL (City Hall), argued that DBKL is the “owner” of Dataran Merdeka (Independence Square) and that it has “exclusive rights” to it. This is part of the problem with politicians who remain in office for too long; they think that everything belongs to them, that only they have exclusive rights to public property. The minister should know that Dataran Merdeka belongs to the nation and all citizens have a right to access it. DBKL’s task is simply to manage it for and on behalf of the people. If the people wish to peacefully gather there, DBKL should facilitate it. Our Prime Minister, for his part, insists that protest and demonstrations are “not the Malaysian way.” Obviously, he has forgotten that the party he now leads was itself born out of a protest movement. He also asked the electorate to bring their grievances to him, promising that he would listen and learn from them; if only he had, citizens would not need to demonstrate. And then there are the phony democrats who pretend to uphold the rights of the people by suggesting alternative venues for demonstrations and even offering to pay for the them. People are not so foolish to see such moves as anything but an orchestrated ploy to marginalize the demonstrators by pushing them to more discreet locations. Of course, whenever there is talk about demonstrations the bully boys in red – that rent-a-band of rowdies with nothing better to do than to hurl insults, act provocatively and play racist games – invariably spring into action. By insisting on the right to hold counter-demonstrations at the same time and at the same place, they provide the police with the perfect excuse to worry about public order. Few doubt, though, that they are anything more that bullies allied to people in high places with a licence to disrupt, sow fear and scare off concerned citizens who wish to exercise their democratic right to protest. Surprisingly, even SUHAKAM, once seen as a small ray of light in an otherwise dark human rights environment, now appears to be taking the government line that such demonstrations are counterproductive. Its new chief dismissed protestors as little more than unwashed and unprincipled agitators who accomplish little at great inconvenience to the rest of society. He also went on to draw parallels with the Arab Spring, now a by-word for chaos and instability, implying that the same thing could happen here if we are not careful. Those who use the Arab Spring to discredit all popular protests often tend to ignore the real lessons from those seminal events. Rather than blaming autocratic governments that oppressed the people for decades, they blame the victims of oppression, corruption and tyranny for rising up to protest. The real lesson from the Arab Spring, which autocratic governments should take to heart, is the one that John F Kennedy warned about decades earlier – that those who make peaceful revolution impossible make violent revolution inevitable. Given the government’s views, it comes as no surprise that the authorities are trying to give the organizers of upcoming demonstrations the run around. The Inspector-General of Police says the police have no objections provided City Hall agrees. City Hall, of course, will find every excuse not to agree. Its clear that neither of these agencies are independent of political influence. Their actions suggest that their primary objective is to find administrative reasons to stymie demonstrations at Dataran Merdeka. This kind of thinking was also evident in the government’s decision to institute a claim for damages against the organizers of the 2012 BERSIH 3 rally. They were hoping to make it too prohibitive financially for demonstrators to use the square. Kudos to the courts for rejecting it. 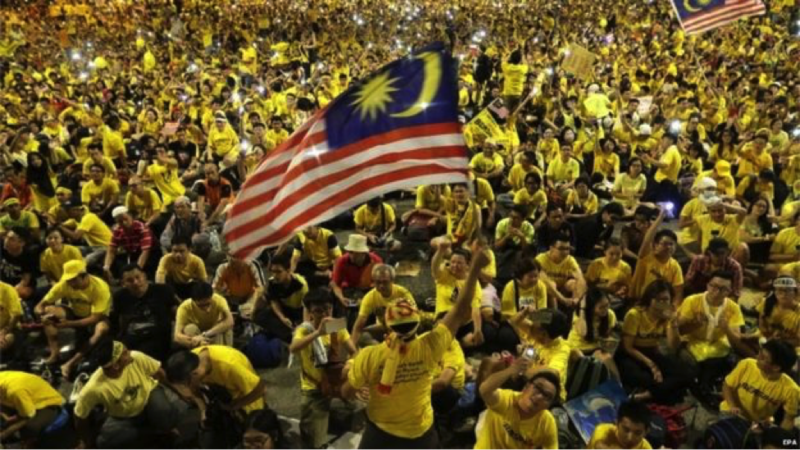 Clearly, while Malaysians tend towards political apathy, many now feel that enough is enough, that it is not the Malaysian way to sit idly by while our beloved nation slips into the abyss of corruption, extremism and misgovernance. Street demonstrations may or may not be the best way to press for change but it is the citizens who must make that call. In any case, it is one of the few options left to concerned citizens in our nation today to express their unhappiness over the direction the nation is taking. The government needs to understand that the protestors are not the enemy. They are not looking for trouble, not looking to violently overthrow the government. They too love their country, value peace and stability. In insisting on the right to gather at Dataran Merdeka to make their views known, they are acting responsibly and in accordance with their rights under the constitution. If there are security concerns, our police should be on hand – to protect the protestors rather than attack them. If city hall is concerned about orderliness and cleanliness, it should work with the organizers to make this the cleanest, most orderly, most organized demonstration thus far. The government can war against its own citizens or let them roar. They can try to silence the voices of dissent or hear the cries for justice, democracy and good governance. Its not the people who are on trial here; it is the government!